Velma Leona Krebs, 92, Botkins, Ohio, died at St. Mary&#39;s Joint Township Hospital in St. Mary&#39;s, Ohio on Tuesday, November 14, 2006 at 2:00 PM. She was born September 8, 1914 in Anna, Ohio, the daughter of John Christian and Mary Ann (Faler) Liess. She was married February 6, 1934 to Eugene L. Krebs and he died March 1, 2000. Surviving are four children, Shirley Chmilelwski of Racine, Wisconsin; Leo Francis Krebs of Dayton, Ohio; Robert Leroy Krebs of Botkins, Ohio and Wayne Eugene Krebs of Botkins, Ohio; eighteen grandchildren and thirty great-grandchildren. Two brothers and one sister are deceased. 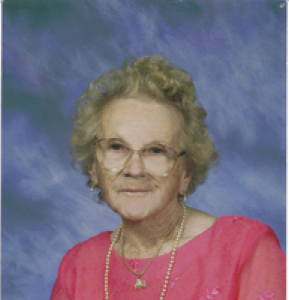 She was a life member of Immaculate Conception Church, Botkins, Ohio and a member of the Rosary Sodality of the church; Knights of St. John Auxiliary; Town and Country Homemakers Club in Botkins, Ohio for many years; the Senior Citizens of Sidney and Botkins; loved flower gardening and playing cards. She was a homemaker. A Mass of Christian burial will be held on Saturday, November 18, 2006 at 10:30 AM at Immaculate Conception Church in Botkins, Ohio with Rev. Patrick Sloneker. Burial will be at Immaculate Conception Cemetery, Botkins. Friends may call at Salm-McGill and Tangeman Funeral Home on Friday, November 17, 2006 from 3-7 PM.